One of the BEST KEPT SECRETS in the Kitchen! Now I know my articles reach a very skilled, experienced audience when it comes to cooking and baking, so this may be old news. But I'll address my topic anyway, in the off-chance some of you aren't up on this. Topic? Parchment paper. What is it exactly, and what are the advantages of using it in our baking? Answer? 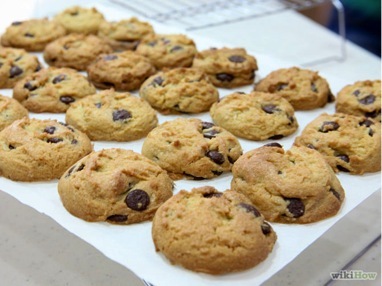 Parchment paper (also called baking paper or baking parchment) is a heavy-duty paper sold on rolls in boxes, like aluminum foil and plastic wrap. Or you can get it as pre-cut, flat sheets (my personal preference). It is moisture- and grease-resistant, and has several uses in the kitchen. 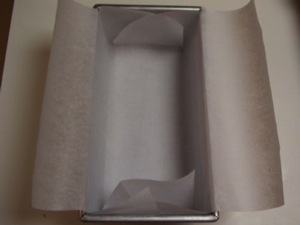 Primarily, parchment is used for lining baking pans. This simple step goes a long ways towards protecting the finish of your pans. Also, lining baking pans with parchment practically guarantees that food won't stick, which is especially helpful when baking cakes and sticky cookies; they literally slide out of the pans. And folks also love baking with parchment paper because greasing baking pans is eliminated-there is virtually no clean-up-a very nice time-saver. Using parchment can save you time in other ways too. You can literally pick up an entire batch of cookies from the baking sheet and transfer them to a wire rack to cool without fumbling with hot pans and spatulas. (No more misshapen cookies.) And parchment also holds up in microwave cooking. Another thing you can do with parchment is make disposable pastry bags-they're quick to make and disposable-thus saving even more time, clean-up-wise. 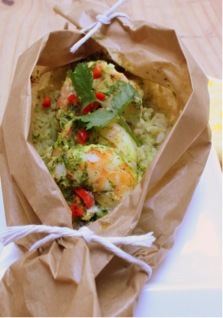 And have you ever baked foods en papillote? This is a French cooking method in which foods and seasonings are cooked together inside an envelope made with the parchment. 1. Rinse fillets and pat dry with paper towels. 2. Cut large parchment hearts for each piece of fish to be baked. Lightly butter inside of each parchment heart. Place 1 piece of fish on 1 side of each heart. 4. Add additional ingredients such as vegetables, herbs, seasonings, flavorings, etc. Fold parchment hearts in half. Beginning at top of heart, pinch the edges together, 2 inches at a time. At bottom tip of heart, fold paper up and over. 6. Place hearts on large baking sheet. Bake 20 to 25 minutes or until fish flakes easily when tested with fork. To serve, place hearts directly on serving plates and cut an "X" through top layer of parchment, folding points back to display contents. You'll find parchment paper in the baking section of the supermarket or with the aluminum foil and plastic wrap. The pre-cut parchment rectangles and circles are available in kitchen specialty stores and restaurant supply stores (where you'll get the best price). Since I've started using it I've become convinced it's one of the best kept secrets in the kitchen! If you're not already using it, give it a try and see if you don't agree.